It's happening more and more frequently. You're in the middle of a conversation, and suddenly, your train of thought is gone. Or maybe you just feel an inexplicable sensation of disorientation. If you're having difficulty concentrating, it may be more than just an inevitable sign of aging. 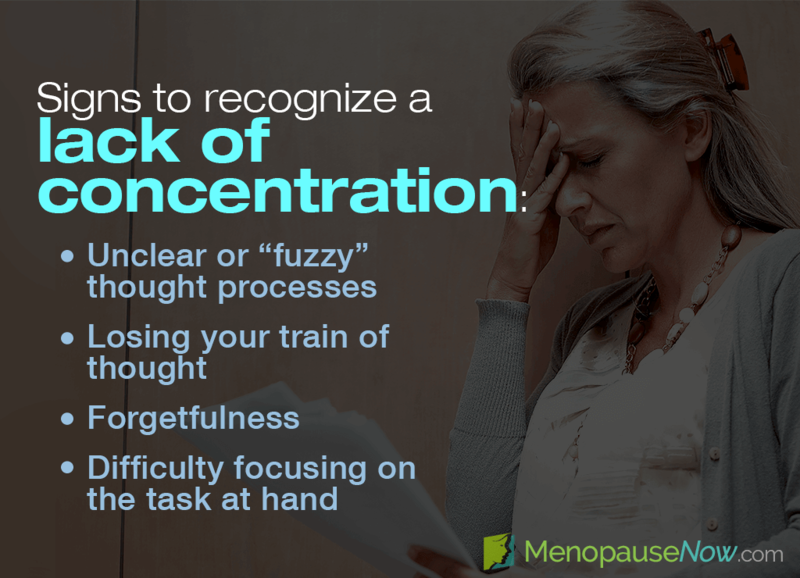 Learn more here about how to recognize a lack of concentration due to menopause. How Can I Recognize This Symptom? The symptoms of a lack of concentration can initially be difficult to identify because of the problem's nature. It can be helpful, therefore, to record what is triggering your decreased productivity and inability to communicate ideas on a daily basis. What Causes a Lack of Concentration? Experiencing symptoms of this menopausal occurrence can be alarming if you don't understand why your cognitive abilities appear to be declining. However, understanding the processes behind menopause and putting its numerous effects into perspective will offer some insight into your concentration problems. In general, menopause is characterized by drastic shifts in reproductive hormones that can negatively affect a woman's physical and psychological well-being. Specifically, shifts in estrogen can impact cognition by influencing neurotransmitter activity in the brain. Also, other causes of difficulty concentrating include increased levels of stress, making it harder to focus; poor nutrition; neurological disorders; and more. Making lifestyle modifications is generally the first recourse for difficulty concentrating during menopause. Eliminate potentially damaging stimulants such as caffeine and nicotine, and begin to improve your diet by consuming more omega-3 fatty acids. Playing memory games, learning a new language, and reading have also shown helpful. Further aid can be found in the form of alternative medicines and, as a last resort, pharmaceutical medications. Click on the following link for more information about natural and effective treatments for difficulty concentrating.